We are in the thick of summer, and that can only mean one thing — it’s time to barbecue! When it comes to a backyard barbecue, nothing beats an outdoor kitchen. Outdoor kitchens open up your options to cook just as you would in the kitchen inside your home. Most importantly, you can hang outside with your guests while you cook, rather than being cooped up in the house during your parties and BBQs. Outdoor kitchens can open you up to a whole new world of barbecuing! To start out, it’s important to find a licensed contractor to help you with this project. Next, find an area in your backyard that makes the most sense to set up an outdoor kitchen. This is usually right along the edge of a patio area or a common “hang out” area for guests. Map out the dimensions of the area that you want to use. Your contractor can start mapping out a plan based on your needs. There are specific outdoor materials and appliances that are needed to ensure the long term durability of your outdoor kitchen. For example, when it comes to the counter-tops, you want to go with stone, tile or concrete. When it comes to gas grills and fire-pits, be sure to utilize a licensed and insured plumber to safely install these components. A plumber can also help you properly set up the sink to connect to your water system. As homeowners, when we invest in a project, we always want the final outcome to boost the value of our homes. Fortunately, outdoor kitchens immediately add to the value of your home. It’s a great luxury that most homeowners are always dreaming of when it comes to the backyard situation. For those who like to entertain, there is no better option than an outdoor kitchen in the summertime. 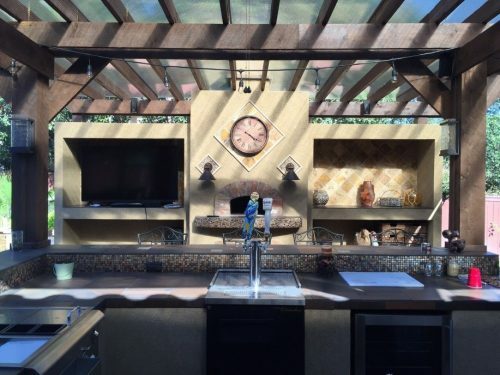 Building an outdoor kitchen takes the help of licensed professionals to ensure that your kitchen operates safely and effectively for a long time. Download the FREE Repairman app from your favorite AppStore, or directly from the RepairmanApp website to connect with verified professionals that can help you with this project. And don’t forget to sign up for our newsletter to receive all of the latest news and updates. For more home improvement project ideas, check out the rest of our blog.